Each school year, the Early Learning Coalition sponsors the Literacy Buddy Program which provides children with books to take home and share with their families. The program also encourages them to express themselves through correspondence with their adult buddy. Children come to school better prepared to learn when they interact with adults who regularly read, write and talk with them. You can become a Literacy Buddy! A Literacy Buddy agrees to receive letters from a child in an early learning facility served by the Early Learning Coalition. 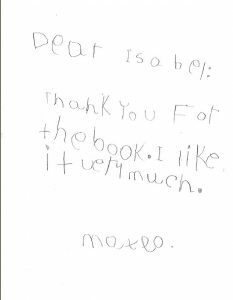 The Buddy in turn sends a letter and high quality book in response to the child’s letter. This exchange takes place three times from mid fall to spring. The program teaches children about correspondence, communication and instills appreciation of high quality children’s literature. Please take a moment to fill out the application to become a Literacy Buddy. Already a Buddy and want to continue with the program? 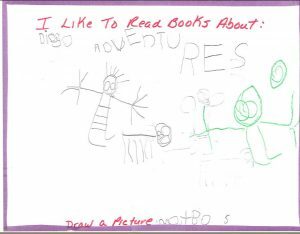 Just click LiteracyBuddies@elcofswfl.org and let us know. You can also use this link to ask for more information about the program, or call (239) 935-6186. Click to access the application on our Facebook page. 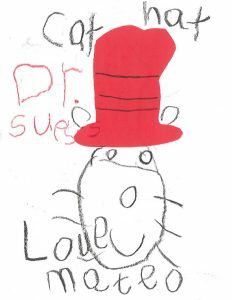 The following writing samples were completed by a child over a span of four months and demonstrate what a difference books and letters can make in the life of a child.